This article aims to give you a high level overview of D3’s capabilities, in each example you’ll be able to see the input data, transformation and the output document. Rather than explaining what every function does I’ll show you the code and you should be able to get a rough understanding of how things work. I’ll only dig into details for the most important concepts, Scales and Selections. William Playfair invented the bar, line and area charts in 1786 and the pie chart in 1801. Today, these are still the primary ways that most data sets are presented. Now, these charts are excellent but D3 gives you the tools and the flexibility to make unique data visualizations for the web, your creativity is the only limiting factor. The selectAll function returns a D3 “selection”: an array of elements that get created when we enter and append a div for each data point. This code maps the input data [4, 8, 15, 16, 23, 42] to this output HTML. All of the style properties that don’t change can go in the CSS. With a few lines of extra code we can convert the bar chart above to a contribution chart similar to Github’s. Rather than setting a height based on the data’s value we can set a background-color instead. The colorMap function takes an input value between 0 and 1 and returns a colour along the gradient of colours between the two we provide. Interpolation is a key tool in graphics programming and animation, we’ll see more examples of it later. Much of D3’s power comes from the fact that it works with SVG, which contains tags for drawing 2D graphics like circles, polygons, paths and text. 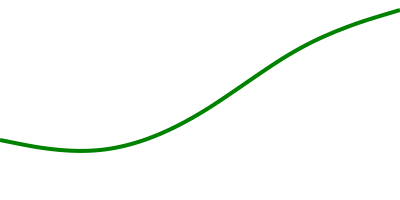 <path> is the most powerful element in SVG. The data sets in the previous examples have been a simple array of numbers, D3 can work with more complex types too. For each point of data we will append a <g>(group) element to the #chart and append <circle> and <text>elements to each with properties from our objects. The variable g holds a d3 “selection” containing an array of <g> nodes, operations like append() append a new element to each item in the selection. This code maps the input data into this SVG document, can you see how it works? 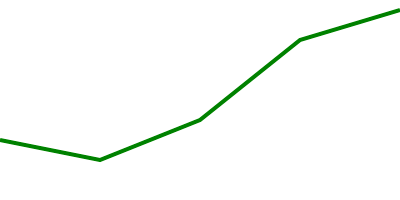 Note: The y values are subtracted from the height of the chart (100) because we want a y value of 100 to be at the top of the svg (0 from the top). 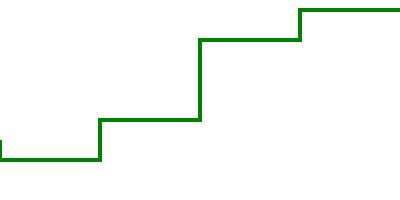 D3 has path generating functions to make this much simpler though, here’s what it looks like. Much better! The interpolate function has a few different ways it can draw the line around the x, y coordinates too. See how it looks with “linear”, “step-before”, “basis” and “cardinal”. Scales are functions that map an input domain to an output range. In the examples we’ve looked at so far we’ve been able to get away with using “magic numbers” to position things within the charts bounds, when the data is dynamic you need to do some math to scale the data appropriately. Ideally we want the y axis values to go from 0 to 30 (max y value) and the x axis values to go from 0 to 50 (max x value) so that the data takes up the full dimensions of the chart. We can use d3.max to find the max values in our data set and create scales for transforming our x, y input values into x, y output coordinates for our SVG paths. These scales are similar to the colour interpolation function we created earlier, they are simply functions which map input values to a value somewhere on the output range. Now we can render a dynamic data set and our line chart will always fit inside our 500px / 200px bounds with 20px padding on all sides. Linear scales are the most common type but there’s others like pow for exponential scales and ordinal scales for representing non-numeric data like names or categories. In addition to Quantitative Scales and Ordinal Scales there are also Time Scales for mapping date ranges. // At which point between 0 and 500 was my 18th birthday?